Unbelievably, it’s time to start thinking about Thanksgiving, Christmas and the entire holiday season. And if you’re like many women, your thoughts are probably running the gamut from “This is my favorite time of the year” to “I’m dreading getting ready for the holidays.” And everything in between. And realistically, even if you really love the holiday season, you’re probably not thinking, “I’m really going to enjoy Christmas this year!” Because you know how much work it’s going to be! And you know that Christmas stress is real and it isn’t pretty! If that’s the case, what you need is a strategy that will help you take the crazy out of Christmas. Believe me, I know all of those feelings. The 6 weeks between “getting ready for Thanksgiving” and “putting away the Christmas decorations” can be some of the most tiring and stressful of the year. And for most women, the idea of relaxing and enjoying Christmas and the holidays seems like a fantasy. I don’t think it does. At the very least, it doesn’t have to become six weeks of stress, craziness and utter fatigue. Because I think that we, as women, wives and mothers, have the power to make it more wonderful and less crazy. 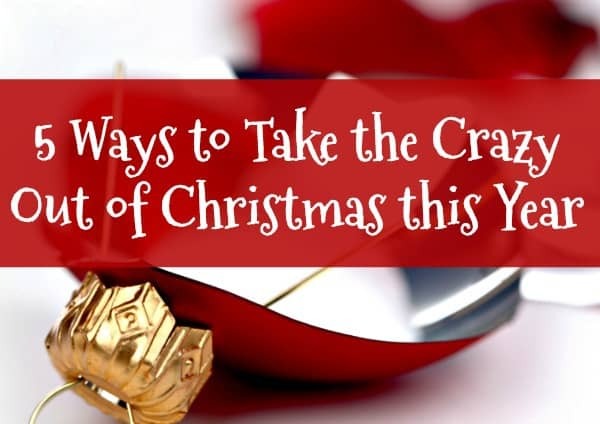 We have power to reduce Christmas stress and take the crazy out of Christmas. But we need to acknowledge and understand that power, then harness it to benefit ourselves and our families. 1. Figure out what you and your husband really want. What does an ideal Thanksgiving, Hanukkah or Christmas look like to you? What does it look like to your husband? Talk about it openly and honestly, and listen to what he has to say. Don’t be surprised if your ideal holidays and his look very different. For example, decorating the entire house may be important to you, but mean nothing to him. And watching football with his family after Thanksgiving dinner may get him in the holiday spirit, but bore you to tears. So bring all of your hopes and expectations out in the open, and encourage him to do the same. 2. Establish your priorities. Now that you know what’s important to both of you, establish priorities for your family. Make a list of the three or four things that are most important to each of you. Maybe for your husband it’s spending relaxed time as a family, choosing gifts that will allow the family to have fun together, and reducing Christmas stress to very low level. Maybe for you it’s starting the holiday season with a clean, uncluttered house, baking cookies with the kids, and entertaining small groups of friends. Then agree to honor each other’s priorities and make them happen. And recognize that, in doing this, each of you will probably have to forgo a few of your “favorites.” If you don’t, you’ll be right back to trying to do everything and driving yourself crazy. 3. Let go of things that don’t fit your priorities. This is where things start to get hard. In order to reduce holiday and Christmas stress and create the kind of holiday season you and your husband envision for your family, some things will have to go. You can’t attend every event, accept every invitation, make every gift, organize every craft, and decorate every inch of the house – not if you want to relax a bit and enjoy the things you determined are most important. Obviously, some activities are required – your children’s Christmas program, your boss’s holiday drop-in, shopping for gifts, and cooking holiday meals. But some are not. So you may have to say no to your neighbor’s dessert buffet, your aunt’s Christmas cantata, your daughter’s friend’s skating party, or your sister-in-law’s all-day shopping trip. Because you can’t do everything, and this year you want to do the things that will make the season fun, relaxing and memorable for your family. Maybe your son likes to go for a hay ride and cut down the perfect Christmas tree, and your daughter enjoys seeing the lights display at the local zoo. 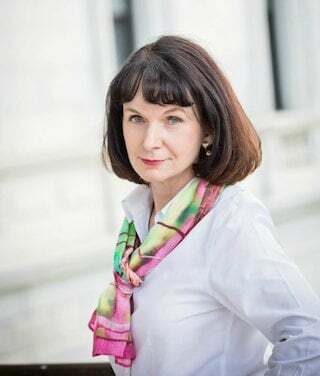 Maybe your husband wants to watch “It’s a Wonderful Life” and drink hot chocolate, and you love for the entire family to bake cookies together. Schedule those things and other favorite activities now; that way, you’re certain to make room for them in your busy schedule. 5. Ask for and accept help. Chances are, your husband doesn’t want you to drive yourself crazy over the next few weeks. And more than likely, he wants to help in ways that will prevent that from happening. But you’ll have to tell him what you need. Yes, it would be great if he could just figure it out on his own, but he probably won’t. Not because he’s dumb, but because he’s not you. So ask for help, then let him do what needs to be done. For example, for many years my husband has shopped for the Christmas gifts for our sons. We always talk about what we want to get for them, but then he does the shopping. Great – that’s one less thing on my list. He’s willing to help with other things too. I just need to ask, then get out of the way and let him do those things. Your husband is probably willing to do the same. This year, start with these 5 steps and work to create the kind of relaxing and joy-filled holiday season you’ve always wanted. 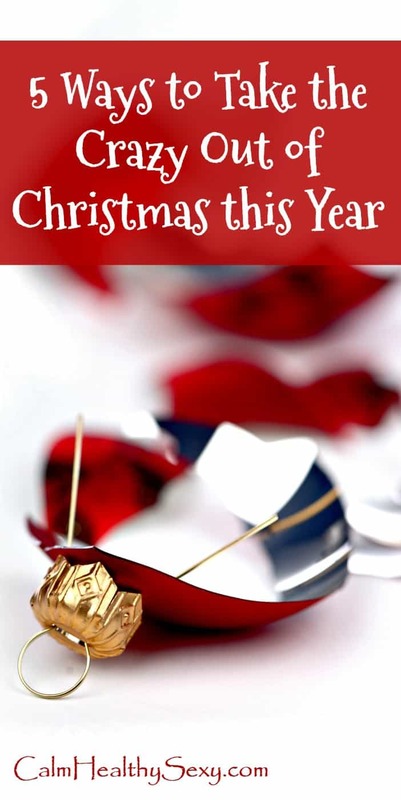 And if you need more ideas or are ready to make a plan that will help you slow down and enjoy your life, marriage, and family this holiday season, check out my holiday planning ebook, Peace. Love. Joy. 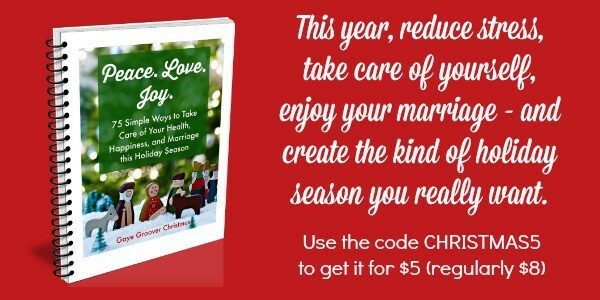 – 75 Simple Ways to Take Care of Your Health, Happiness, and Marriage this Holiday Season. Use the code CHRISTMAS5 to get it for $5 (regularly $8). Good post! It’s a shame that it has come to this, that we need so much help navigating the holidays without losing our ever loving minds! But here we are, and I’m skipping the ladies church luncheon this month. Hi Ashley – Yes, it seems kind of crazy that we have to make choices like “skip the ladies church luncheon,” but I think that’s exactly what we have to do! “This year just chill, relax and enjoy the yuletide season.” Love that!